Economic and reusable. These polyethylene slide mailers have a sturdy resealable clasp. The top of the mailers is clearly labeled and slide labeling is visible through a plastic cover. 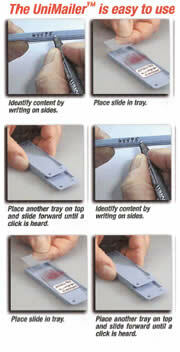 These disposable slide mailers are ideal for secure shipping and storing of slides. Made from polypropylene, the protectors hold two standard slides (25 x 75 mm and 1 x 3"), with large snaps that are easy to secure. These disposable polypropylene containers are ideal for secure shipping, storing, or staining slides. They hold five standard slides (25 x 75 mm and 1 x 3") and feature slotted channels inside the walls to keep slides separated and for easier removal. The lid closes securely to keep slides safe. Ideal for storage as well as transport of slides. Unique in its ability to hold and secure slides as large as 50x75 x 10/12 mm thick. Measurements: 3.195" (L) x 2.156" (H ) x 0.708" (W) (81.15 mm x 54.76 mm x 17.98 mm) Holds 5 slides. Holds up to 5 slides 3 x 1" in size. These mailers are rigid, strong and durable with a convenient flip-top, snap-on lid. When it stands in its upright position, it can be used as a staining container, with a minimal amount of solution being used. Packaged 25 mailers/pk, 8 packs/cs. Sakura Finetek - Designed for safe transport or mailing of up to four glass slide 1x3". Unbreakable plastic container with flip top cap fits through mail system. This is a tamperproof multi purpose container for mailing, staining or storing microscope slides. Constructed of extra strong and opaque clear polypropylene, and high density polyethylene leakproof tamper evident screw cap (The LockMailer can also be used without the tamper evident feature by not used the lock tab), it will hold up to 4 standard 3 x 1" or 25 x 75 mm slides vertically. Inside chambers are slotted to keep slides safely separated. For color coding purposes, use Capinsert™ (#61805-series) that may be inserted on top of closure. This LockMailer™ can be used as small staining vessel. This unit is designed for maximum stability on a bench top with liquid volume only 14 ml. Each standard volume of one slide is 2 ml, therefore when you want to stain 4 slides in this vessel you need only 6 ml of staining solution. Dimensions: 35 x87 mm H (1⅜" x 3-7/16" H). Packaging: 100 per pack. Following many suggestions made to us from our customers in the labsThe UniMailer™ is a truly versatile new model mailer which can easily be used for handling and shipping one or as many slides as needed with one type of mailer. Made from high impact polystyrene, the UniMailer™ is a one-slide tray. Not only do they fit snugly on top of each other but they are also secured by an innovative locking mechanism. You may also want to insert a tamperproof tie or attach an ID label. Each tray allows for the placing of slide in a horizontal position for full visibility. Slides can be easily inserted or removed. As well UniMailer™ can also be used to provide safe storage for those valuable slides you want to protect. It accommodates 25 x 75 mm (1" x 3") slides with or without cover glass. The mailer measures 89 mm x 29 mm x 6 mm (3½" x 1⅛" x ¼"). Identification can be made on three sides or on top. The mailer is available in many popular pastel colors for easy identification. Packaging: 50 per box, 200 per case. Made from 0.050" (1.29 mm) solid cardboard, measures 3¾" x 1⅝" when folded. The mailer holds one 3" x 1" glass slide with or without cover glass and has a thumb groove for easy removal. A special cut corner identifies the top of the mailer. Made from .085" (2.17 mm) cardboard and measures 3" x 4¼" when folded. This mailer is unprinted. Upon request the mailer can be printed with warnings for medical specimens. Each mailer conforms to U.S. Postal regulations regarding minimum size for First Class. The same construction as 2-slide mailer above, but holds four 3 x 1" slides. Made from durable polypropylene (except 8L size which is made from polyethylene). 5 ml to 1L sizes are supplied with tight-fitting screw caps and warning labels for 10% Formalin with extra space for writing. All of the containers (except the 5 ml size) are graduated on three sides. 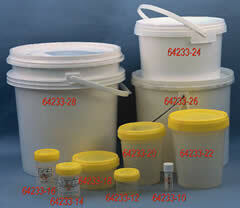 2L to 8L sizes are supplied with snap-top lids, adhesive warning labels, and bucket carry handles. No graduation. 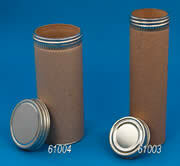 These fiberboard screw cap mailing cases meet all US Postal Regulations in mailing biological specimens. It also meets IATA regulations regarding shipments of infectious substances. They are constructed of heavy duty fiberboard and have crimped metal rims and seamed metal bottoms. The metal screw caps are autoclavable and offer a secure closure. Available in several sizes. The set consists of an inner aluminum screw cap container and an outer fiberboard screw cap mailing tube. This double type unit is required by US Postal for mailing of etiologic agents or biohazard specimens. 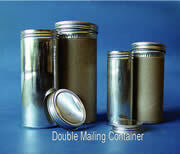 Each aluminum container is autoclavable and the cap is lined to prevent leakage. The most convenient, organized and versatile way of storing 3" x 1" (75 x 25 mm) microscope slides vertically. This impact resistant SlideFile™ Storage System can hold up to 400 slide per unit in just 1720 cm3 (105 cu. in.) and are stackable for space saving. Each SlideFile System includes a slide box and two removable trays. A transparent hinged cover makes it easy to see at a glance the content of the box. SlideFile™ System is a removable tray inside the storage box having 100 numbered slots. All slides are stored vertically for easy insertion and removal. In the upright position, one is able to read bar codes without having to remove the slide from the box. For space saving purposes, you can double the amount of slides simply by storing two slides side-by-side per slot. And for maximum storage space or long-term storage, simply remove the SlideFile Tray and line up 400 slides in three rows. Two index cards numbered from 1 to 100 are included to allow for slide recording titles. Similar to the SlideFile™, the junior model can hold up to 200 slides per unit in just 860 cm3 (53 cu. in. ), and it is stackable to save space. Each SlideFile™ Jr. includes a slide box and a removable tray. A tinted hinged cover makes the contents of the box easy to see at a glance. Removable tray inside the storage box having 50 individual numbered slots. All slides are stored upright for easy insertion and removal as well as reading the bar codes without removing the slides. To save space , you can double the amount of the slides simply by storing 2 slides per slot. And for maximum storage space, simply remove the tray and line up 200 slides in 3 rows for long term storage. This system is not autoclavable. Made from high impact polystyrene This model is similar to the DrainRack™ above but can hold up to 100 microscope slides in 50 individual numbered slots. The rack is autoclavable. Stainless Steel slide tray racks that accept aluminum slide trays. The rack alows air to circulate over the slides and both sizes of racks hold up to 100 slides. The aluminum slide trays have elevated ridges to separate 76 x 26 mm slides and finger holes for easy removal. Ideal for drying fresh mounts. The Aluminum slide trays are available in two configurations: 10 slide position and 20 slide position. Made from tough, resilient ASB plastic which offers long life. Holds 100-standard 1 x 3" slides positioned vertically for easy insertion in pre-numbered grooves allowing for simple identification and retrieval. Dimensions: 14.25" L x 0.25" W x 3.75" H.
A cover which is optional is made from clear polystyrene offering full visibility and it protects the slides from dirt and dust when they are not in the drawer.